Imagine having a bonfire on the beach after a long day of fun swimming, playing in the sand, tennis and exploring. That’s what you will get at Flor de Cabrera. Situated on 2 acres of beachfront property, this 18,500 sq. ft. estate has thought of every need you might have. With a full staff, spa services and a kid-friendly atmosphere, this is one villa you will never forget. Located in the Orchid Bay Estates, Flor de Cabrera has over 18,500 square feet of space with ten (10) bedrooms. 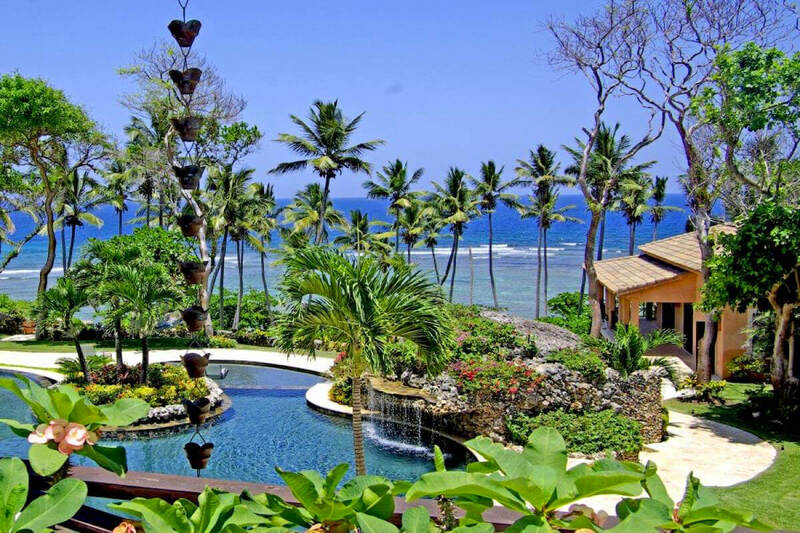 Flor de Cabrera Villa sits on almost 2 acres of beachfront and include high-end furnishings of custom mahogany, cherry and walnut. Outside, the chaise lounges and terrace seating are designed for immediate relaxation and enjoyment. Rates do not include: island charges of 10%. Bedroom 1: Gardenia Suite: Separate from the main house. Located on Orchid Bay Beach. Taxi/Chauffeured van is recommended and can be arranged ahead of time. From Puerto Plata or Samana airports. Gratuity not included.